While I haven’t exactly been working quite as diligently on Mega Man Land within my Xbox One Minecraft world over the Christmas week – especially considering my birthday was last week too – but I certainly have made good progress on it. In last week’s update, I showed, or at least tried to show, the two major sections of the Mega Man 4 area – the Title and Stage Select screens; as well as set up my plan for the Robot Master sprites. The initial plan was to build them up vertically – and that plan quickly changed as I was working through building Toad Man. Going vertically – which may have looked real cool, but probably would have obscured the view of the bigger screens – was going to be a much slower process than I liked. The big issue boiled down to the fact that the RM sprites have so much diagonally set lines – which going vertically with no backer makes it more time consuming, since you have to frame it up. The other option would have been going through each line in the sprite, individually to build them, which again, would be real slow going. Also I made a second and third addition to the “sprite sheet field” that has made it a bit more complicated/cluttered but in the long run I think will help it look even better. 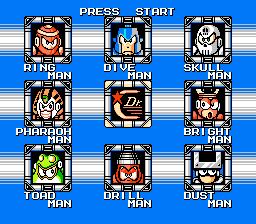 The original idea was to just put the eight Robot Masters initial sprites, in the order that I play them, along with signs with their DWN number, weapon, and weakness. While that is still the plan, I also added in a second sprite of Mega Man, using that RM’s weapon, along with the actual weapon sprite. 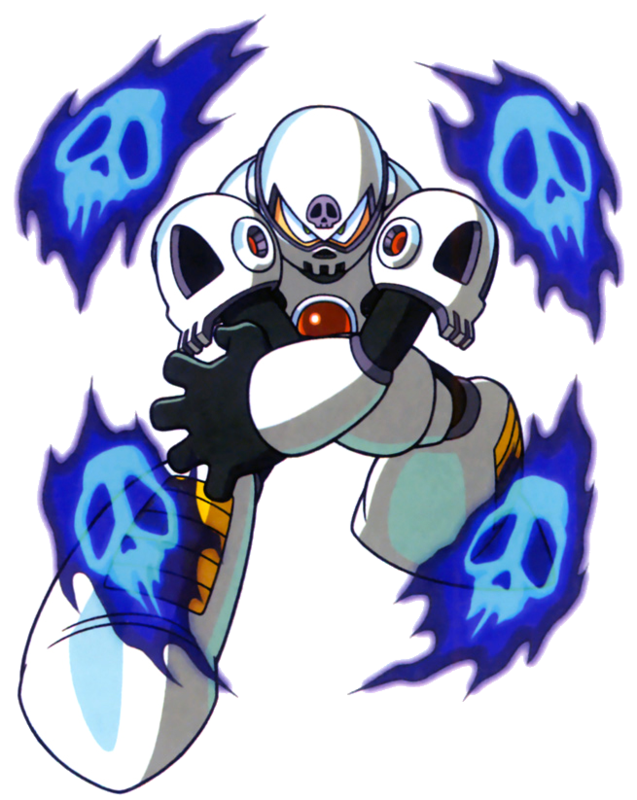 Using the sprite of Mega Man actually firing the weapon results in a few changes across the board – the Rain Flush and Pharaoh Shot both are thrown weapons, while Flash Stopper is a full screen flash weapon (meaning the sprite is just Mega’s standing sprite) and Skull Barrier is a standing shield weapon. The rest are of course regular shooting sprites, but the variation in size within the RM’s also means that there aren’t quite perfect straight lines across the board. The other addition I made, which will probably be changed around with the later games at least, was adding in the weapon tile in that same field. With Mega Man 4 they added in a full screen pause menu that featured all of the weapons, along with a small, 16×16 tile illustrating the weapon. I took that tile and dropped it into the field surrounding the Mega Man sprite. While they look fine there, again, there’s a lot of variation which makes the placement of the tile a little bothersome. Moving forward, if the game has a tileset for the weapons, I’ll probably break out the pause menu as a third screen project. That should work fine with the games after Mega Man 4, and I can probably finagle something for Mega Man 3, the first two games will be a little different. 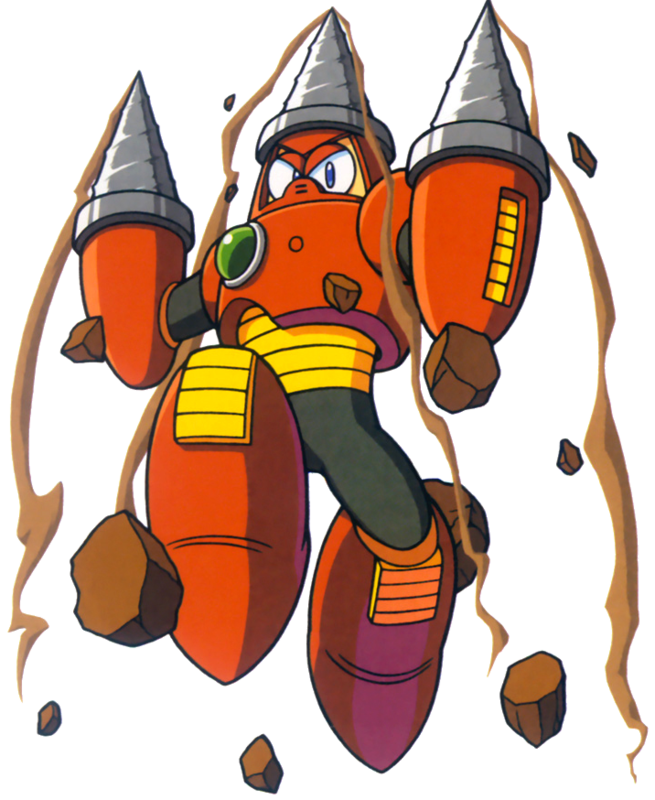 As far as actual progress, I’ve got two more Robot Masters to build – Dive Man and Drill Man – along with their weapon sprites. Beyond that there’s the matter of cleaning up the whole Mega Man 4 field, looking at the blank space I have left and maybe making a few last minute upgrades to make it look even better. One thing I definitely want to look at is whether it’s worth taking a look at Ring Man, Drill Man and Bright Man’s portraits to see if the new dyed clay blocks would make them look closer to the actual art from the game. Anything else would just be extra fluff to make it look nice, and would also help me space it out on either side for Mega Man 3 and Mega Man 5. And as far as the next true step – I will be heading backwards through the series, starting with the Stage Select for Mega Man 3 – which I’ve mentioned will be a tricky deal. It’s a slow process for sure, but I always get a little surprised when I finish a section, fly way up to look it over and see it from above. It really does look pretty damn cool, and I am really liking the overall plan for sure. This entry was posted in Mega Man Land and tagged Capcom, Mega Man, Mega Man 4, Pixel Art, Robot Master, Sprites, Video Games by Dan Fasulo. Bookmark the permalink.